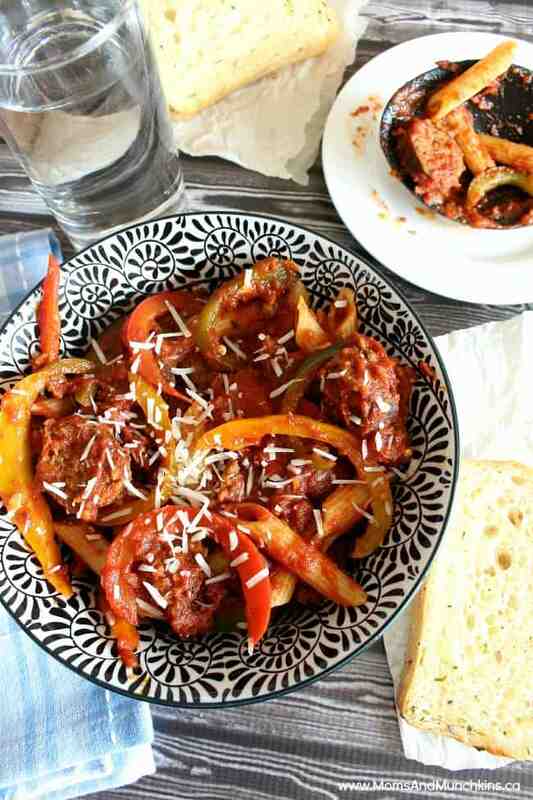 This spicy sausage pasta recipe is so easy to make and tastes delicious! My family likes this recipe because it’s packed full of flavor and it’s easily put together. We use whole wheat pasta in our recipe for the added health benefits. Sure, the sausage is a little greasy…but you make up for it with the vegetables and whole wheat pasta, right?! You can make this spicy sausage pasta either super spicy or mild depending on your family's taste preference. The recipe here is on the spicy side. If you want to tone it down a bit, substitute the hot sausage for mild and reduce the amount of chili powder and crushed red pepper flakes. In a frying pan, brown sausage and cook thoroughly. Cut into bite sized pieces. While the sausage is cooking, saute the onions and peppers in a separate a large frying pan. Cook until slightly softened. Add the crushed tomatoes to the onion & pepper mixture in the frying pan. Add the chili powder, garlic and crushed red pepper flakes. Mix well and simmer on low heat. Add the bite-sized sausage pieces to the sauce mixture. Simmer for 15 minutes. While the sauce is simmering, cook the pasta until tender, rinse and drain. The Parmesan cheese can either be cooked into the sauce or sprinkled on top of the plate right before serving. This spicy sausage pasta pairs perfectly with some garlic toast. Does your family eat a lot of pasta dishes? For more delicious recipes, check out our special Recipes page. Don’t miss a delicious update by following along on Facebook, Twitter, Pinterest and Bloglovin’.